Themelios is an international evangelical theological journal that expounds and defends the historic Christian faith. Its primary audience is theological students and pastors, though scholars read it as well. It was formerly a print journal operated by RTSF/UCCF in the UK, and it became a digital journal operated by The Gospel Coalition in 2008. 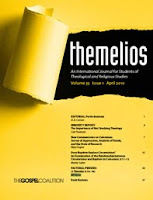 Themelios is copyrighted by The Gospel Coalition. Readers are free to use it and circulate it in digital form without further permission (any print use requires further written permission), but they must acknowledge the source and, of course, not change the content. D.A Carson currently serves as the General Editor of the journal. Past contributors include a wide variety of scholars such as D.A. Carson, J.I. Packer, John Stott, Gordan Wenham, Richard Bauckham, Gerald Bray, Craig Blomberg, Geoffrey Bromiley, I. Howard Marshall, Richard Mouw, Michael Homes, etc. As you can see, there is a pretty eclectic group of scholars, and many of them would not hold to Calvinistic, Covenantal, or Baptist views. But it is still worth checking out. All the issues since 1975 are freely available for download and reading here. See what you think. Since tomorrow we will celebrate our countriy's birthday, I thought I would share with you a free series I found our about. It is called A Biography of America and involves a number of leading historians discussing and explaining the various periods in the development and history of America. Professor Donald Miller introduces A Biography of America and its team of historians. The program looks at the beginnings of American history from west to east, following the first Ice Age migrations through the corn civilizations of Middle America, and the explorations of Columbus, DeSoto, and the Spanish. As the American character begins to take shape in the early 17th century, English settlements with dramatically different personalities develop in New England and Virginia. Professor Miller explores the origins of values, cultures, and economies that have collided in the North and South throughout the American story. Professor Maier tells the story of how the English-loving colonist transforms into the freedom-loving American rebel. The luminaries of the early days of the Republic -- Washington, Jefferson, Adams -- are featured in this program as they craft the Declaration of Independence and wage the war for freedom from British rule. At the dawn of the 19th Century, the size of the United States doubles with the Louisiana Purchase. The Appalachians are no longer the barrier to American migration west; the Mississippi River becomes the country's central artery; and Jefferson's vision of an Empire of Liberty begins to take shape. American historian Stephen Ambrose joins Professors Maier and Miller in examining the consequences of the Louisiana Purchase-for the North, the South, and the history of the country. Individual enterprise merges with technological innovation to launch the Commercial Revolution — the seedbed of American industry. The program features the ideas of Adam Smith, the efforts of entrepreneurs in New England and Chicago, the Lowell Mills Experiment, and the engineering feats involved in Chicago's early transformation from marsh to metropolis. The Industrial Revolution has its dark side, and the tumultuous events of the period touch off intense and often thrilling reform movements. Professor Masur presents the ideas and characters behind the Second Great Awakening, the abolitionist movement, the women's movement, and a powerful wave of religious fervor. Simmering regional differences ignite an all-out crisis in the 1850s. Professor Martin teams with Professor Miller and historian Stephen Ambrose to chart the succession of incidents, from "Bloody Kansas" to the shots on Fort Sumter, that inflame the conflict between North and South to the point of civil war. As the Civil War rages, all eyes turn to Vicksburg, where limited war becomes total war. Professor Miller looks at the ferocity of the fighting, at Lincoln's Emancipation Proclamation, and the bitter legacy of the battle"and the war. Professor Miller begins the program by evoking in word and image the battlefield after the Battle of Gettysburg. With the assassination of President Lincoln, one sad chapter of American history comes to a close. In the fatigue and cynicism of the Civil War's aftermath, Reconstructionism becomes a promise unfulfilled. As America celebrates its centennial, five million people descend on Philadelphia to celebrate America's technological achievements"but some of the early principles of the Republic remain unrealized. Professor Miller and his team of historians examine where America is in 1876 and discuss the question of race. Steel and stockyards are featured in this program as the mighty engine of industrialism thunders forward at the end of the 19th century. Professor Miller continues the story of the American Industrial Revolution in New York and Chicago, looking at the lives of Andrew Carnegie, Gustavus Swift, and the countless workers in the packinghouse and on the factory floor. Professor Miller explores the tension between the messy vitality of cities that grow on their own and those where orderly growth is planned. Chicago"with Hull House, the World's Columbian Exposition, the new female workforce, the skyscraper, the department store, and unfettered capitalism"is the place to watch a new world in the making at the turn of the century. The making of money pits laborers against the forces of capital as the 20th century opens. Professor Miller introduces the miner as the quintessential laborer of the period"working under grueling conditions, organizing into unions, and making a stand against the reigning money man of the day, J. Pierpont Morgan. Professor Brinkley compares the presidencies of Theodore Roosevelt and Woodrow Wilson"the Warrior and the Minister"in the first decades of the 20th century. Professor Miller discusses American socialism, Eugene Debs, international communism, and the roots of the Cold War with Professor Brinkley. Professor Martin offers a fresh perspective on Progressivism, arguing that its spirit can be best seen in the daily struggle of ordinary people. In a discussion with professors Scharff and Miller, the struggles of Native Americans, Asian Americans, and African Americans are placed in the context of the traditional white Progressive movement. The Roaring Twenties take to the road in Henry Ford's landscape- altering invention-the Model T. Ford's moving assembly line, the emergence of a consumer culture, and the culmination of forces let loose by these entities in Los Angeles are explored by Professor Miller. Professor Brinkley continues his story of 20th-century presidents with a profile of Franklin Delano Roosevelt. Brinkley paints a picture of America during the Depression and chronicles some of Roosevelt's programmatic and personal efforts to help the country through its worst economic crisis. First Lady Eleanor Roosevelt is at FDR's side and, in many respects, ahead of him as the decade unfolds. America is enveloped in total war, from mobilization on the home front to a scorching air war in Europe. Professor Miller's view of World War II is a personal essay on the morality of total war, and its effects on those who fought, died, and survived it, including members of his own family. World War II is fought to its bitter end in the Pacific and the world lives with the legacy of its final moment: the atomic bomb. Professor Miller continues the story as veterans return from the war and create new lives for themselves in the '50s. The GI Bill, Levittown, civil rights, the Cold War, and rock 'n roll are discussed. The entire team of historians joins Professor Miller in examining the last quarter of the 20th century. A montage of events opens the program and sets the stage for a discussion of the period-and of the difficulty of examining contemporary history with true historical perspective. Television critic John Leonard offers a footnote about the impact of television on the way we experience recent events. I hope you enjoy the fourth of July holiday this year. Now, as with any discussion of American history, one is going to encounter potential biases in the historians doing the work, but this series should still be helpful if you keep on your critical thinking cap while you read and watch. You can see them all here. I hope you enjoy your fourth of July holiday!